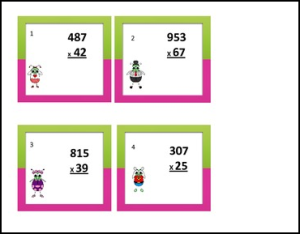 24 multi-digit multiplication task cards for your students to use at a center or in groups to practice multiplication. This set includes an answer key and answer sheets. Perfect practice for mastery of Common Core Standards 4.NBT.B.4 & 5.NBT.B.5 multiplying multi-digits.